The Fellowship was fortunate enough to obtain a copy of REVOLUTION #1 from IDW Publishing. The story is by John Barber & Cullen Bunn, with art by Fico Ossio, colors by Sebastian Cheng, and letters by Tom B. Long. Relations between Cybertronians and the humans aren’t good; and it’s been made worse since Mount Olympus (which had a food source for the robots) just blew up. So the Autobots try to mend the relations by trying to help out, meanwhile investigate what happen in Greece. Unfortunately, things deteriorate and war has begun between the Autobots and G.I. Joe. The situation gets worse as an alien knight named Rom enters the fray…. But what caused the incident at Mount Olympus? And who is responsible? 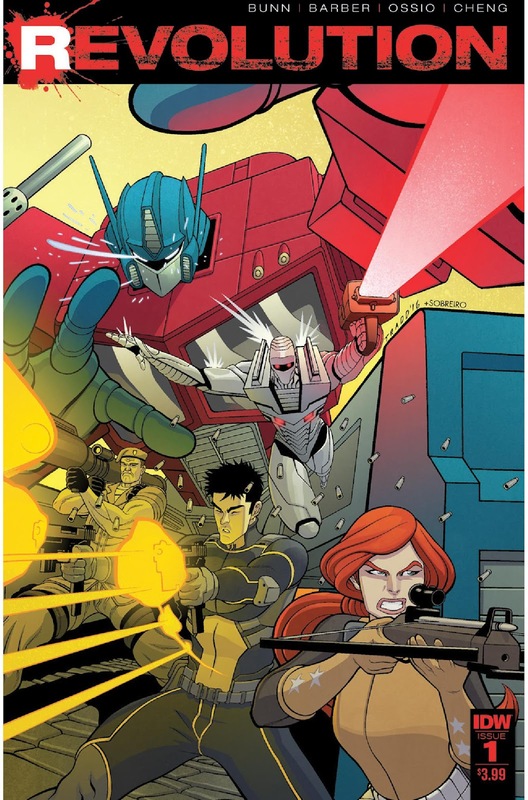 Quite an action-packed start for the first Hasbro toy-comic crossover. Barber and Bunn’s script delivers a story that is pretty battle intensive with enough of a mystery to keep you interested overall. Ossio’s art is awesome; it’s pretty much one would visualize while having the action figures fight each other. Sebastian Cheng’s colors are so vibrant and beautiful. This could be a lot of fun. Check it out. REVOLUTION #1 is in stores now or available at www.idwpublishing.com.